Designed by Sarah Maxwell of Designs by Sarah J featuring her fabric collection Primo Batiks: Sea for Marcus Fabric. "Wandering along a quiet path, enjoying the sights and sounds of nature, always recharges my creative energy. 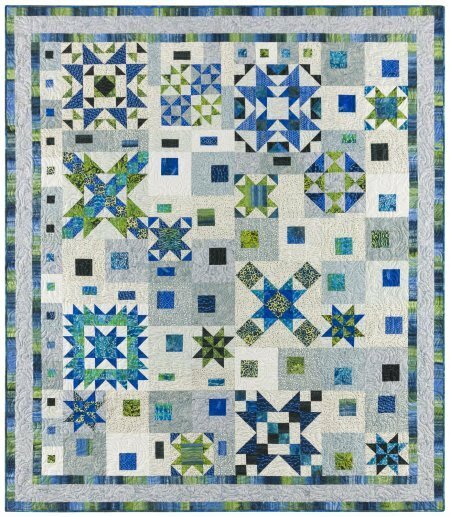 Graphic Gems captures a random stroll along a beach or in a garden, from stepping stone to stepping stone, taking in the bursts of color of flora and fauna, symbolized by a dazzling variety of star blocks." This BOM is anticipated to begin in March 2018 and run for 9 months at a cost of $32.99 per month plus monthly shipping if applicable. Kits will include patterns and all fabrics needed to complete the top and binding. The finished quilt is approximately 76" x 87" quilt.